The Isaac Israels Suite is situated on the ground floor overlooking the beautiful private garden including private terrace amidst rare fruit trees, flowers, statues and a small pond. 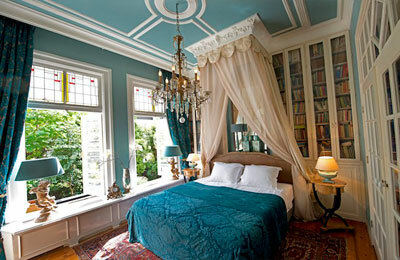 The suite, decorated in a palette of powder blues and sand, of approx. 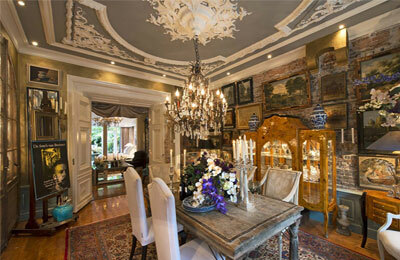 70m2 (775 ft2) consists of a personal writing desk overlooking the garden, large fauteuils, a fireplace, uniquely constructed authentic ornamented ceilings, Italian chandeliers, and canopy made from the finest linen. The private Italian decorated bathroom has a separate walk-in shower with rain showerhead, a choice of luxury toiletries, bathrobe and slippers and hairdryer.